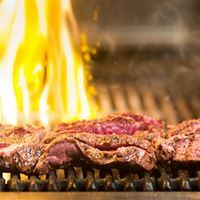 Hudson steak house based in Bath specialises in prime dry aged steaks, delicious starters with a fusion influence and some mouth watering classic dishes. 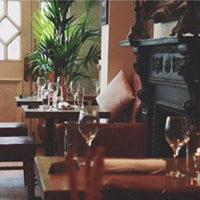 Served in a relaxed stylish conversion of a notorious Victorian pub. 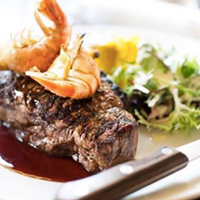 Owner Richard Fenton decided to take on a run down, edge of town pub, and by specialising in well sourced and dry aged prime beef has created a destination restaurant that has won the best restaurant award from three different publications. The downstairs bar serves well crafted cocktails, an award winning wine list and the full menu under sparkling chandeliers. The upstairs grill room features an open kitchen and glowing Victorian ﬁreplaces with views over the park. Excellent service is very important to the restaurant and a warm welcome is always waiting. Top local hotels like to send their customers to Hudson so it's best to request a reservation to avoid disappointment. This is our second time here. The food is amazing, very relaxed atmosphere. Staff excellent. Having been before, we chose to come here on a Thursday early evening. Food was good as always and drinks were nice. We were sat downstairs this time which didn't have the same atmosphere as upstairs which was disappointing. Never disappointed when we go th Hudson. Fabulous in every way . Really delicious food, friendly quick service. It was a real treat. 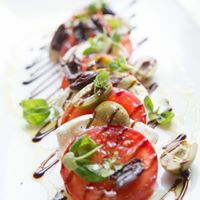 Quality of food, cleanliness levels and service never fail to disappoint every time we dine at Hudson. Had a fantastic meal, would definitely return. Excellent dining experience at Hudson. Our waitress was first class, helped us choose wines (well informed and professional) and made the whole evening a wonderful experience - especially as it was my fathers birthday. Thank you Hudson, shame we do not live closer so we can visit more often! Great meal. Lovey staff especially dark haired bar man with moustache who made us feel so welcome. Food delicious . Lovely suprise for my daughter waitress brought ice cream out with a candle for her birthday. Hudson’s is my 3 children’, who are 16, 18, 21 years favourite restaurant . Thank you & we will definitely be back soon. . Excellent find, a little out of our way normally but easy to find and parking right outside the door. We were a little early but were eagerly greeted and offered drinks whilst our table was being prepared. The food was very good, if a little pricey but you pay for quality. Would I visit again? At the drop of a hat! We love Hudson, a real treat every visit. Been eating here now for a few years and wouldn’t eat steak anywhere else. Introduced friends to this wonderful restaurant who now only eat here when want a steak. Good steak but a million miles away from Gallaghers Steakhouse, Las Vegas ! Really enjoyed our visit to Hudson - and as big steak lovers, we agreed that it was the best steak we have ever had in a restaurant! Would recommend it to everyone. Very friendly service from all staff and the food was incredible, highly recommend. We had a really enjoyable meal and took advantage of the early evening deal. We appreciated the complimentary bread sticks and dip. The meal itself represented very good value. The service was friendly and the atmosphere was great. I'd thoroughly recommend it. A lthoroughly enjoyable evening, well catered for with excellent staff who were attentive without being intrusive. Great service and the food was just perfect!! Would definitely recommend and come again if I'm ever in Bath again. Simply amazing! Best steak in the UK and all food is cooked to perfection. Service is always friendly and professional. Had early booking. Waiter seated us in a  crammed corner,with the view of a door,and other couples practically on same table! Just discovered there was lovely eating area upstairs which I wish we were offered,as it was a special occasion.